Audio Post 1 – What Will You Take With You? Back in April, I had the opportunity to return to London for a five-day visit. From my American perspective, that city’s history is simply “off the scale.” To get a sense of that scale, one of its’ newer buildings, the current Saint Paul’s Cathedral, was completed a little after the founding of the city of Detroit over 300 years ago. Among the stops that I made was to the Museum of London, only a very short distance from the site of John Wesley’s Aldersgate experience in May of 1738. The exhibit which captured my attention at the Museum of London was a remembrance of the 350th anniversary of the Great Fire of London in September, 1666. There were a lot of artifacts from that era in the exhibit that day. Many were books which provided eyewitness accounts of the fire. Another artifact was a charred brick from Pudding Lane, where the fire started (pictured here). 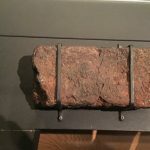 This brick “experienced” that fire; We were allowed/encouraged to touch that brick and connect ourselves with its history. There was a large backlit timeline of the fire as well as an interactive map which showed the spread of the fire in old London, a city which in 1666 was mainly made up of wood-constructed buildings. As I walked through the exhibit, the dimension of human suffering that fire caused became clearer and clearer. The Great Fire wasn’t a fictional story. It happened to real flesh and blood people, whose lives were turned upside down so very quickly. It is estimated that 70,000 out of 80,000 buildings were destroyed by the fire in a matter of only a few days. Thousands lost their homes and their livelihoods. The official death toll stood at six, though historians suspect the death toll could have been much larger, possibly in the thousands as the fire would have hidden the evidence of those deaths. Thomas Goodwin, a Puritan minister of the era, lost a sizable part of his large, personal library. In walking through this exhibit, you could feel the near sense of panic those Londoners felt to halt the fire. They had nothing resembling modern fire-fighting equipment. Buildings were purposely blown-up to act as a buffer from the fire’s further spread. Pack your trunk. Save your belongings from the Great Fire! Time is short and space is limited so you could only choose THREE things. What will you take? What is most precious to you? Or most useful? I’ve asked myself that same question over the last several months. If I were in a situation from which I had to flee for my life and could only take three things, what would they be? From the safety in which I currently live, I think that I’d like to take with me a copy of the Bible, some notecards, a few pens and a copy of Thomas Goodwin’s 1651 book “The Heart of Christ.” (I know that’s more than three items but shirt pockets come in handy). “What will you take with you?” is a question which millions have people have asked in the past and in the present moment in the face of fires, floods, earthquakes, hurricanes, wars, political upheavals and disasters, both natural and human-made. In recent weeks, a series of hurricanes and earthquakes have devastated many of the Caribbean islands as well as parts of Mexico and the parts of the states of Texas and Florida in the United States. Catastrophes have a way of sifting out the important from the unimportant in our lives. Like Thomas Goodwin’s library, very valuable things, perhaps irreplaceable things, will be lost. Yet, things to which we have been attached seem less important as a result, perhaps even garbage-worthy. Several years ago, the Detroit area encountered a “storm of the century” which resulted in local freeways being flooded out and thousands of families, including my in-laws, experiencing something which they never faced before, several feet of water in their basements. Family treasures and memorabilia, safe and dry one week, became water- logged items for the next week’s garbage pick up. Eventually, each of us will face circumstances when we will be forced to leave the place we live. Perhaps we will have years, or months or days to prepare for it. For some, like Detroit’s “Storm of the Century”, it will come quickly and unexpectedly. To that place we are going, we cannot take even one of our earthly possessions. That moment, will be the moment of our death. We will leave time to enter into eternity. As we flee from this world, we can take no earthly possession. Yet, we can take a heavenly one. 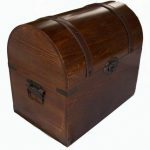 In your spiritual version of the Great Fire of London chest, carry with you a love and trust in God in Christ. It is your only sure possession which will last you now and for eternity. 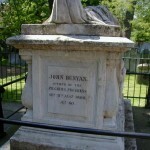 In Episode 54, we will be discussing the history and significance of a cemetery in London known as Bunhill Fields. 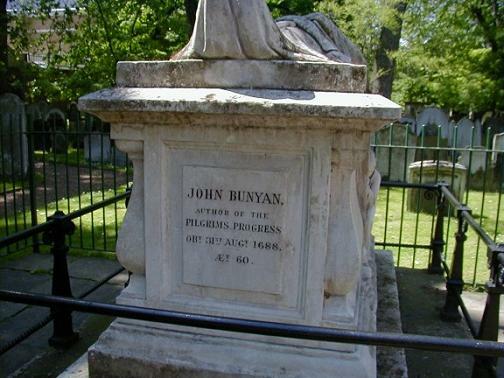 The enclosed picture is of the grave of John Bunyan at Bunhill Fields.